Updated: Nov. 26, 2018, 8:30 p.m.
An infusion of $215,000 from the state was added to the Hall County Schools budget on Monday, Nov. 26, to convert the district’s bus radios to digital and expand communications coverage to 99 percent of the county. 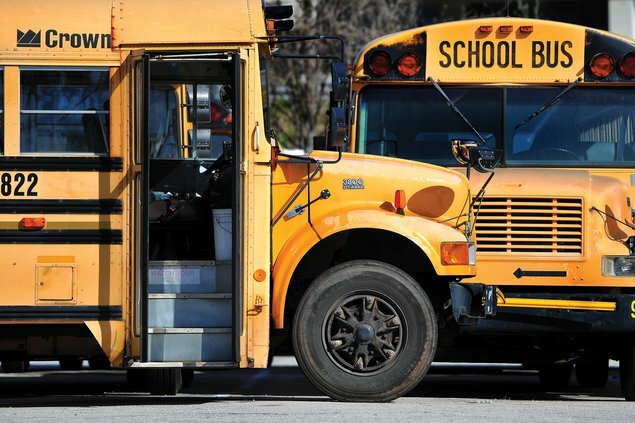 Hall County has approximately 400 school buses in its fleet. “We are always looking to improve security,” Board of Education vice chairman Craig Herrington said, adding that the upgraded radio communications are another piece of the puzzle. Hall County Schools has allocated about $700,000 in new funding for school safety measures since a deadly shooting at a high school in Parkland, Fla., in February. This includes a new silent alarm network and other emergency communication systems added to all schools after a successful pilot project in the spring and new stun guns for school resource officers. Clay Hobbs, director of transportation, said the current analog radios use a VHF signal and can only reach about 80 to 85 percent of the county. Antennas have long been stationed at Wauka Mountain Multiple Intelligences Academy and along Skitts Mountain in North Hall. The Skitts Mountain antenna is being removed, the Wauka Mountain antenna will remain and a new antenna will now be located on a water tower near Flowery Branch High School to maximize coverage, according to Hobbs. The new radios will have roaming technology, allowing buses to pick up the strongest possible signal from either of the two antenna stations, depending on the bus’ location. The state funding comes on the heels of a spate of incidents at schools across Hall County in recent months that have officials on alert about security threats. In September, a Clermont man was accused of threatening to shoot up Wauka Mountain elementary and is now facing an indictment in federal court regarding firearm possession. That same month, a Gainesville man was accused of having an Airsoft pistol in the school safety zone near Lanier College and Career Academy. In early November, a sixth-grader at East Hall Middle School was arrested after another student reported he had a weapon. The school was placed on lockdown after the report. And on Nov. 16, a Chestatee Academy student was suspended after the Hall County Sheriff’s Office and Hall County Schools investigated a possible threat made on social media. It was “quickly determined” that the school and students were never in danger, and the student was not charged with a crime. Morris said each instance involved great communication to either dispel or end the purported threats. “When things don’t go noticed, that’s what concerns me,” he added. Superintendent Will Schofield said there are always limitations in what officials can do to ensure safety and security on school campuses.